A sound golf course design principle is to have the first hole play fast and forgiving, yet set the tone and character for the holes that follow. Notice there are lots of tees to choose from, the fairways are wide, there isn’t much rough but it is rough, and bunkers are few. I tried to distort your sense of distance by placing the front bunker away from the green so don’t let me fool you into taking one or two clubs too short. Smart, bold play will be rewarded. This stretch of land has very subtle features, and the little hill at the beginning of the fairway requires you to trust me and play directly over it. Remember, I said “over it”, and all it takes is a smooth easy swing with the driver to put in great position for your second shot. This land naturally falls to the left and away from you and so does the back half of the green; so don’t be too aggressive on your approach shot. Nowhere is the angle of play more dramatic and demanding than on this hole. From the back, I challenge the long hitter to fly the left center bunkers and end up with an easy second shot. Play too far right away from the bunkers and there is a nasty little grassy hollow that wants your golf ball. From the other tees located on the edge of an old wagon road, the tee shot gets easier the further forward you move. Play as close to the bunkers as you dare and enjoy this wonderfully natural golf hole. 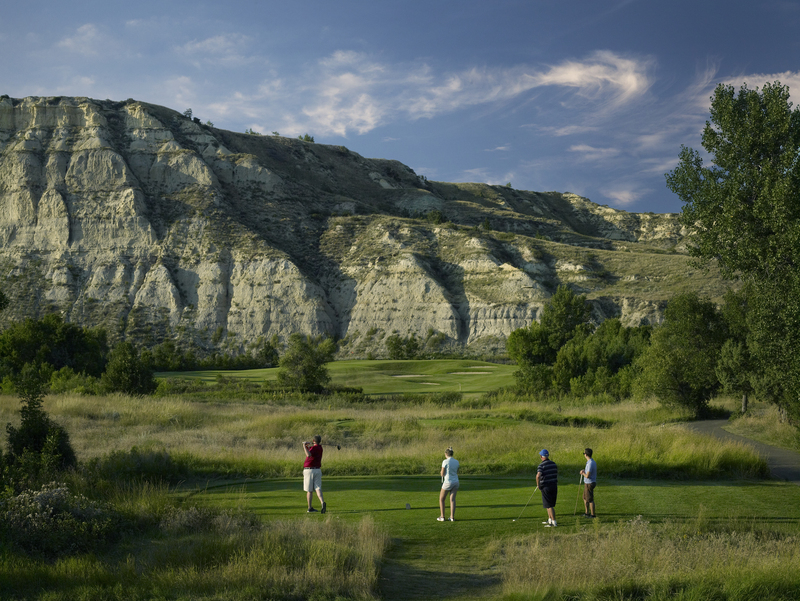 The Little Mo (as in Missouri) River created this golf course site by bringing down Badlands sediments in the spring melt waters, depositing them along it’s edges when it flooded. Now and then it takes back some of those deposits as it meanders northward. In time, the Little Mo will take back the tees on this hole but in the meantime, it allowed me to design a hole that sort of follows the river as it turns slightly left. The key to this hole is to play along the left edge of the fairway, closest to Lil’ Mo, for the easiest approach to this bowl shaped green. When we first walked the land I was charmed by the combination of small erosions and trees found on the left side of the green. Our goal was to leave those little hollows untouched and in native prairie grasses as a hazard and give lots of bailout room to the right. On a calm day this should not be a difficult hole, but on a windy one, safe is better than sorry. The toughest of the Par 5’s and for good reason. The tees on this hole sit on top of the natural floodplain ridge that continues all the way down to the green. Aiming left is a must off the tee as the fairway slopes gradually from left to right. A blind second shot over the fairway bunkers makes for a strategic placement if you plan to leave yourself an easy third. Even the longer hitter will need all he’s got to get there in two. Either way requires excellent shot making to make par, and birdies will be rare. “Away from the river and into the woods” is the bad play on words of a favorite American Christmas song, but it accurately describes this golf hole. The ideal tee shot should just clear the right hand bunker, for the further left one ends up, the more difficult the approach shot is to this angled green. However, too far right and it’s “…into the woods we go.” Those cute little undulations in the fairway were a gift from Little Mo, and I gave you the right front bunker to distort your distance estimating. Again the land allowed me to give two distinct play angles to this par 3 hole. From the right side tees, Davis Creek and the bunker are not much of a factor, while from the left tee all you see from tee to green is creek, sand, and scoria rock. Scoria is formed when underground coal deposits are ignited from prairie fires, and as they smolder they calcine or fire bake the clay deposits around them into red stone. You see lots of scoria on the back nine holes as well as throughout the entire Badlands area. Davis Creek is sort of hidden on the left side of the driving area so the best line of play is to the left of the fairway bunker. Since this hole also plays through the edge of the woods, a little too far right or left of the fairway center may require some creativity on shaping a second shot through or over the trees. The smart play is to the middle of this green, for the right rear hole locations are meant for only the best of players who can really spin and stop a shot on a reverse slope.